The Third Expert Meeting on Harmonizing Forest-related Definitions, organized in Rome in January 2005, tackled the problem of the ambiguous use of forest-related definitions in various international processes. The overall goal of this meeting was to improve communication and understanding of forests among stakeholders and to contribute to the harmonization of definitions related to forest resources and management for various purposes. On the basis of this reasoning, 14 mutually exclusive levels of forest naturalness were proposed in order to incorporate the most logical and generally accepted parts of existing definitions (Buchwald 2005). Primary forests (n10-n5): Relatively intact forest areas that have always or at least for the past sixty to eighty years been essentially unmodified by human activity. Human impacts in such forest areas have normally been limited to low levels of hunting, fishing and harvesting of forest products, and, in some cases, to historical or pre-historical low intensity agriculture. n8 Very high degree of naturalness – Frontier forest – A frontier forest is an area meeting the following criteria: it is primarily forested and predominantly consists of indigenous tree species. It is big enough to support viable populations of all indigenous species associated with that forest type […] even in the face of the natural disasters – such as hurricanes, fires, and pest or disease outbreaks – that might occur there in a century. It is home to most, if not all, of the other plant and animal species that typically live in this type of forest. Its structure and composition are determined mainly by natural events, though limited human disturbance by traditional activities of the sort that have shaped forests for thousands of years -such as low-density shifting cultivation – may be acceptable. As such, it remains relatively unmanaged by humans, and natural disturbances (such as fire) are permitted to shape much of the forest. In forests where patches of trees of different ages would naturally occur, the landscape exhibits this type of heterogeneity. (Rearranged/shortened from World Ress. Inst.:http://www.wri.org/ffi/lff-eng/). n7 Very high degree of naturalness – Near-virgin forest – Forest ecosystems (forest scale) untouched long enough to have attained structures, dynamics and species composition similar to virgin forest, even though they may have been significantly modified, e.g. by clearcutting or agriculture at some time in the past. They are distinguished by a mixture in time and space between different seral stages, e.g. between old-growth stages and younger stages. Human impact on the forest structures is not obvious to see. The time necessary in untouched development before this level can be reached depends on how modified the situation was at the start. It is at least several hundred years if the starting point is a plantation-like forest. Buchwald, E., 2005. A hierarchical terminology for more or less natural forests in relation to sustainable management and biodiversity conservation, Proceedings: Third expert meeting on harmonizing forest-related definitions for use by various stakeholders Food and Agriculture Organization of the United Nations, Rome, 17-19 January 2005. FAO, 2005. Proceedings: Third Expert Meeting on Harmonizing Forest-related Definitions for Use by Various Stakeholders. Food and Agriculture Organization of the United Nations, Rome. Mansourian, S., Rossi, M., Vallauri, D., 2013. 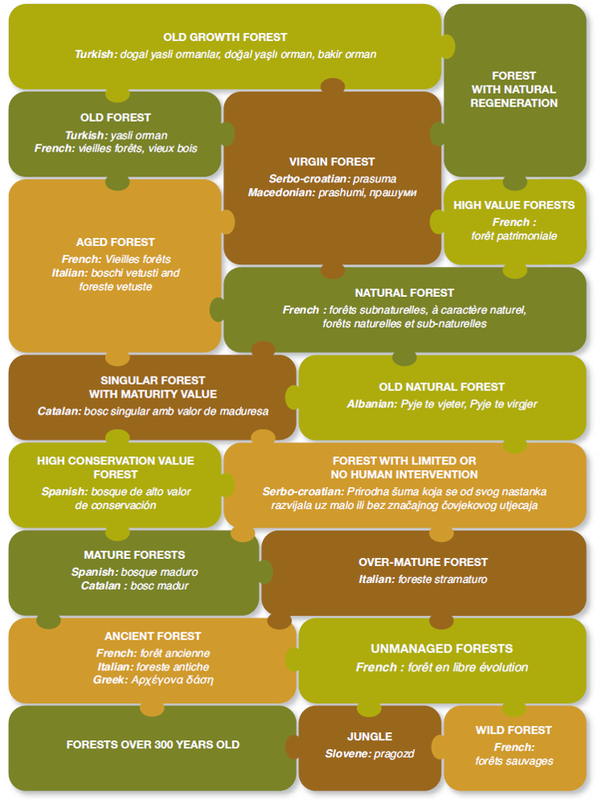 Ancient Forests in the Northern Mediterranean: Neglected High Conservation Value Areas., Marseille, France, p. 80. Peterken, G.F., 1996. Natural woodland: ecology and conservation in northern temperate regions, Natural woodland: ecology and conservation in northern temperate regions. Cambridge University Press, Cambridge UK.